Living in Devon has many plus points, not least the wealth of talented artisans, crafters and independent businesses who live and work here. One of those people happens to be my good friend Sharon Mitchell who owns the successful business Soap Daze. 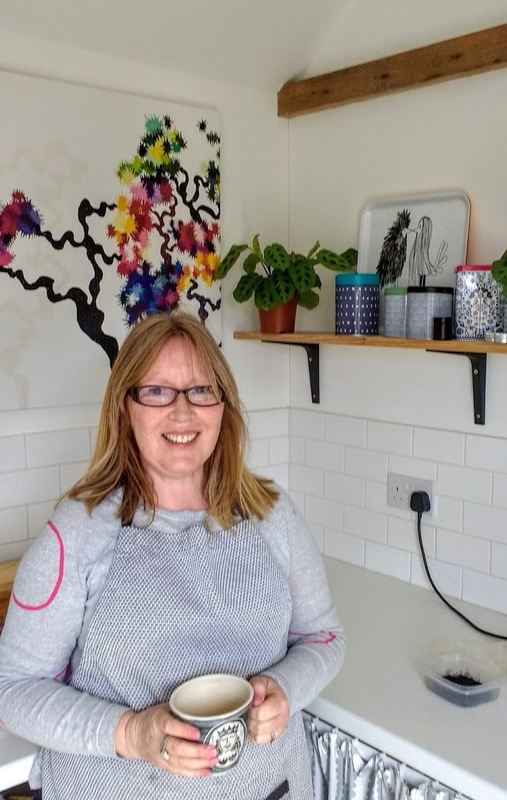 As the name suggests, Sharon makes handcrafted, vegan and natural skincare products from a workshop in her garden, where her aim is to make wholesome, boutique quality items using simple ingredients and which are above all, kind to the skin and the environment. 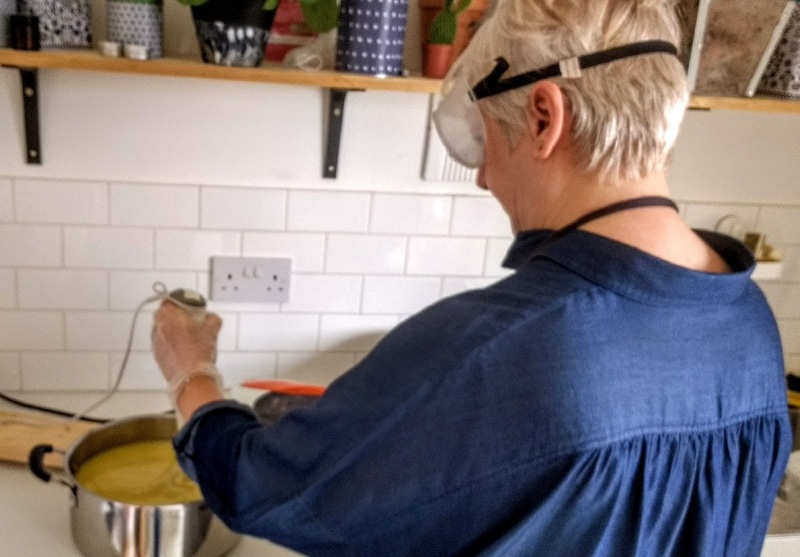 I was delighted to recently be invited to attend one of Sharon’s soap making workshops, where I had the opportunity to make my own batch of soap. It is really important to Sharon that all her products are made using only the purest of ingredients, using plant oils, botanicals,essential oils,herbs and spices. 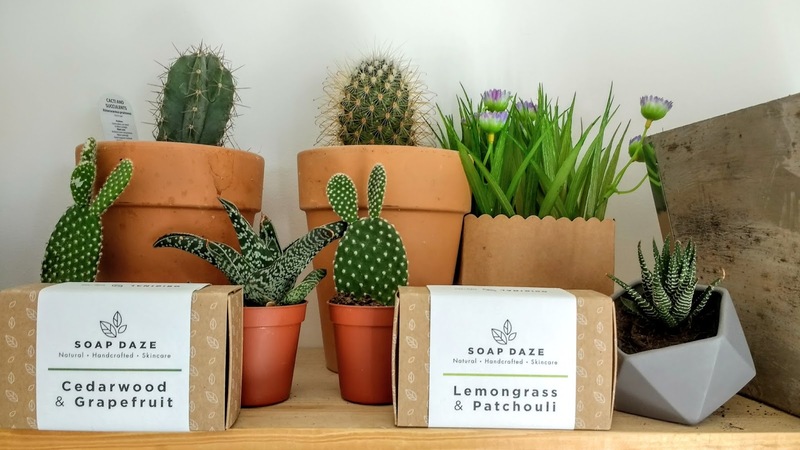 All of Soap Daze products are 100% natural and preservative free. After a lovely cup of freshly brewed coffee, Sharon and I sat down to plan the ingredients. You get to chose from an array of different oils, herbs and spices depending on the kind of soap you would like to make. There are oils to suit all manner of skin types and as you can imagine the smell in the workshop is divine. 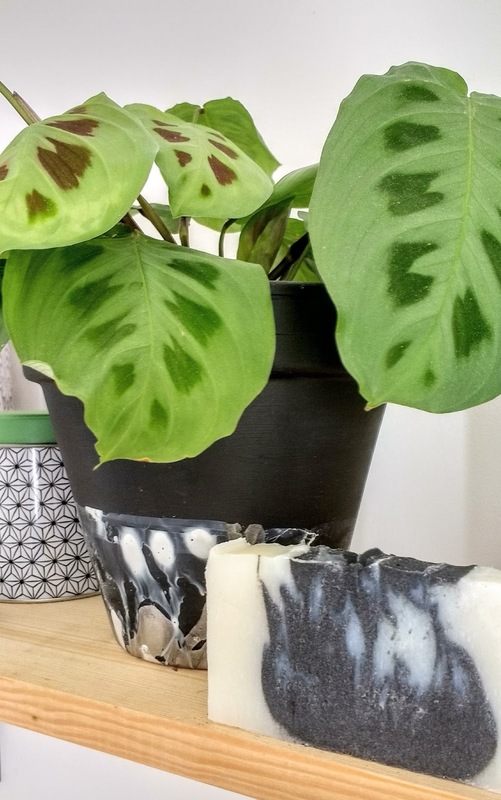 I decided as I have four men in my home, to make soap which would not only appeal to them in looks but would also be good for their varying skin types. 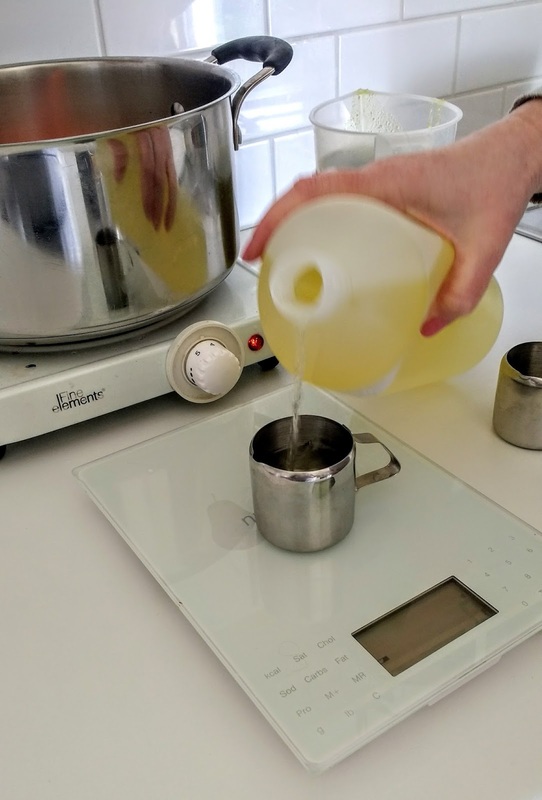 Sharon worked out the scientific side of measuring my chosen oils and the NaOH content (this is more commonly known as Sodium hydroxide or Lye) and is used in soap making as a process called Saponification, this is the chemical process of making soap. Basically the reaction between the sodium hydroxide and a fat (usually the oils). You are left with soap and glycerin. Glycerin is a fantastic moisturiser, which commercial soap makers extract to put into more expensive products. So as you can imagine when you buy handmade soap from Sharon it still contains all the glycerin and is therefore really moisturising. As a repeat customer of Soap Daze for many years I can certainly vouch for that. Her bars of soap are a generous size and last for much longer than shop bought bars.. As someone who has never been too good with skincare in the past, I have always washed my face with soap (yes I know, shock , horror) It was only when I first started using Soap Daze soap I realised that actually, not all soaps are the same and my skin is left feeling wonderfully soft and moisturised after use instead of dry and tight. 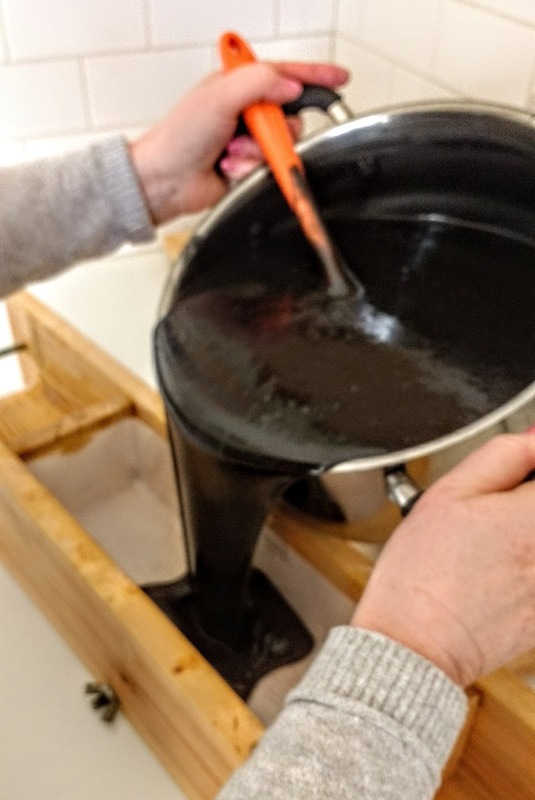 After choosing and measuring out coconut oil, avocado oil, sweet almond, tea tree, lemon , grapefruit and activated charcoal for my soap, we were ready to start work. 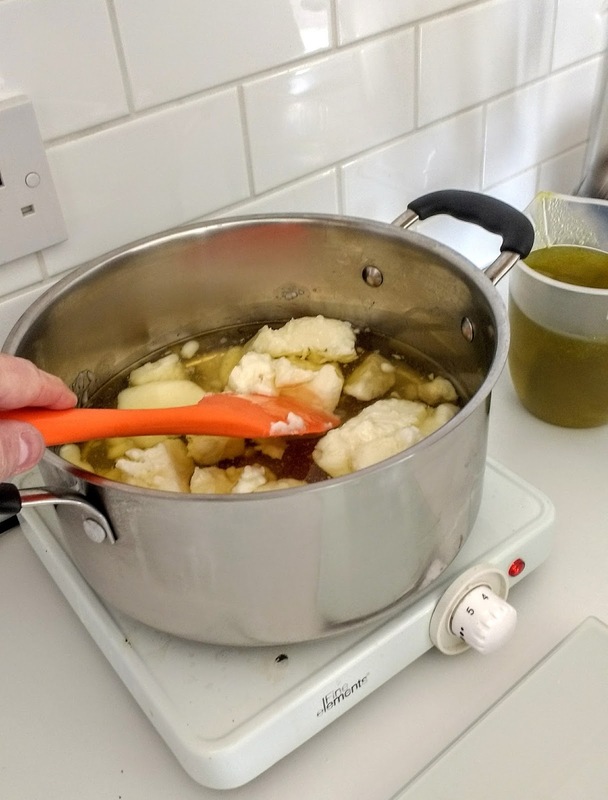 We started by melting the solid oils in a pan and then added the liquid oils. We then made up a solution of sodium hydroxide. This is the dangerous bit ! On with the goggles and the gloves! The temperature rises to 70c and caustic fumes are formed. Sharon takes health and safety very seriously and along with a safety briefing before we start she switches on the extractor fan. Very fetching, but necessary. When the oils and sodium hydroxide solution are a similar temperature (35 – 40 degrees) they are mixed together with a stick blender. 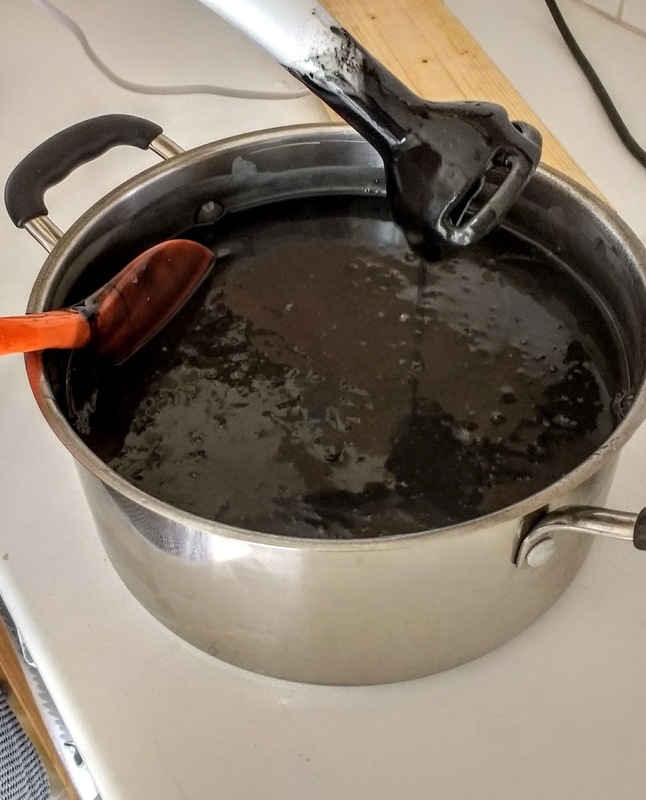 We then added the essential oils, tea tree, lemon and grapefruit and the activated charcoal. 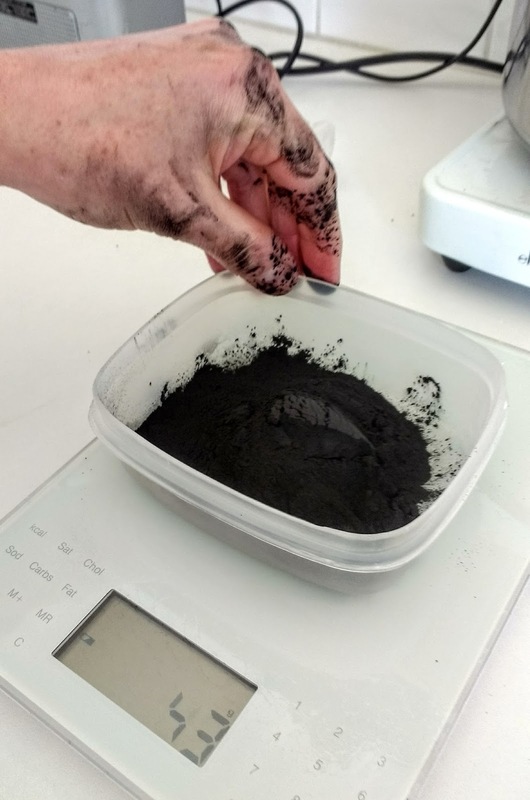 Activated charcoal is great for cleansing skin and gives the soap the most beautiful black colour. I know, black ! me ! Isn’t this just a gorgeous deep black. 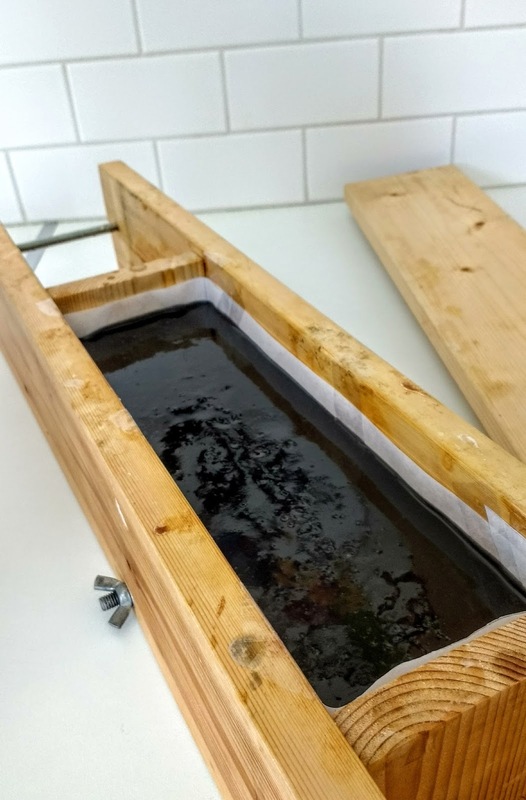 Once everything is mixed to the correct consistency its time to pour the soap into the wooden mould where they are left for two days. After two days Sharon cuts the soap into bars and the bars are then left to cure for four weeks. After the four weeks I can collect my soap (as Sharon also conveniently lives near me). If you travel to the workshop, Sharon will send your soap to you in the post when its ready. I’ll be sure to update on how we are doing with the soap when I receive it. 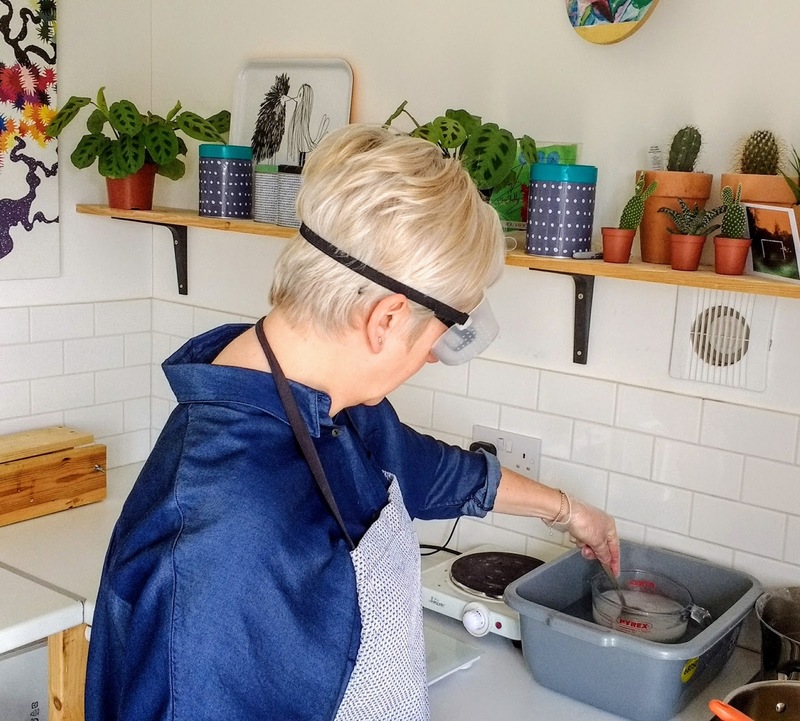 In the meantime, If I have inspired you to take one of Sharon’s workshops you can find all the details HERE I personally think its a great value for money way to give a really different gift to someone. Perfect for birthdays, Christmas, mother’s or even father’s day. Suitable for both men and women. Sharon is a bright, bubbly and very friendly lady who will really put you at ease. You can have a workshop by yourself or with a friend. So whether you live in Devon or are planning a holiday visit, I can highly recommend you take this workshop. Next Post New Tap ! The smell in the workshop is divine Susie. Can't wait to get my soap. Its really good fun Cate and also great value for money. Not only is the soap top quality with no additives, it lasts forever ! What a fun thing to try your hand at! I've seen them being made before (in Rhodes) but never had a go myself. That sounds like a lot of fun to do and it's unusual to have completely black soap!